How many times have you been mowing the lawn or walking across it only to have your feet sink into a mole tunneling system? Or maybe you’ve seen large dirt mounds in the yard made by moles. Either way, many people know they’ve got moles, but just live with it. 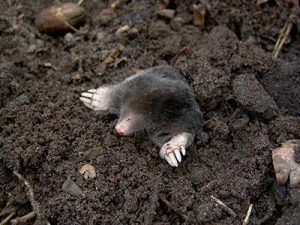 Moles are relatively harmless to humans, but they can cause thousands of dollars in damage to your lawn, pet containment fences, plant root systems, irrigation equipment, and other things. MoleShield from Envirocare Pest Control can stop this damage before it happens. How many moles are in my yard? Everyone asks this question, and frankly it’s a hard one to answer. Our MoleShield service will remove 2-4 moles in the average yard. Do mole repellents, poisons or pesticides work? The internet is full of products and methods for getting rid of moles. Probably the most prevalent is the idea that if you treat the lawn for grubs, the moles will disappear. Unfortunately, if you use this method you’ll only be left with a grub-free lawn – the mole’s main food source is actually earthworms! As for sound and smell repellents, we’ve yet to see one that works consistently. There are some poisons on the market that do work (and we’ve used them), but by far our greatest success has come from using traps. With traps you’re sure that the offender is gone. How does your MoleShield service work? Initial Visit: A service technician will thoroughly inspect your yard and place MoleShield traps directly into the tunnels the moles have created. We’ll flag all the trap locations with a MoleShield flag. Follow-Up Visits: The service technician will return every 7-9 days to check the traps and start removing the moles. We’ll then re-inspect the yard to check for more mole activity. Is the MoleShield service dangerous for my children and pets? Envirocare Pest Control is proud to have an excellent safety record. Our MoleShield traps are set underground, so children and pets are very unlikely to be pinched, but we still recommend exercising caution when children and pets are around traps. How long will it take for my yard to be completely free of moles? On average, a yard will be mole-free after 4-5 services. Some homes may require more visits, but you’ll still only charged for the moles we catch ($75 each). Will moles come back to my yard? Maybe. Once a yard is clear of moles, it’s possible that new moles will move in to fill the vacancy. That’s why we warranty our work for 30 days (see our service agreement for details). How much does the MoleShield service cost? Our mole services are based on the amount of exposed grassy areas your property has. The initial service visit, when traps are set underground and marked, can range from $225-$325. We then return every 7-14 days to reinspect the traps. You are only charged for the moles we catch – each mole is $75. MoleShield by Envirocare Pest Control is the best mole removal service in Connecticut. Please call our office for a service fee. We offer both annual and per-mole trapping programs.